It all started with a box. A box with a huge treasure: 271 Picasso works, including six oils on canvas, 28 lithographs, and some rare cubist collages and sketchbooks, dating from 1900 to 1932. The total value of the treasure trove is estimated at between 60 and 80 million euro. When the artist died in 1973 the box disappeared. It reappeared almost half a century later in 2010, when Pierre Le Guennec and his wife Danielle asked the Picasso Estate for certificates of authenticity for some of these unpublished works. Le Guennec had worked as a handyman for Picasso in his villa in Mougins, in the south east of France, where he even installed an alarm system. The couple has always stated that Picasso's wife, Jacqueline, gave Le Guennec the box with the 271 works inside as a present shortly before Picasso's death in 1973. The Le Guennecs claimed to have forgotten it for decades in their garage, at the back of their small house in Mouans-Sartoux, near Cannes. But the Picasso Administration, led by Claude, one of the artist's sons, dismissed Le Guennecs' story as “ridiculous" and the painter's heirs filed a complaint in 2010 before the Court of Grasse. The box was seized. The couple recently went on trial accused of possessing stolen goods. The trial, based on witness accounts, suggested that Maurice Bresnu, a longtime driver for Picasso and husband of a distant cousin of Pierre Le Guennec, had helped Pierre Le Guennec to get the job with Picasso. Bresnu allegedly swiped some works, but according to the public prosecutor, all legal actions vanished with Bresnu's death in 1991. On the other side, Le Guennec's lawyer, Charles-Etienne Gudin, said that Picasso gave the works to his client to thank him for his kindness and he never tried or wanted to sell the works saying "You don't sell gifts". The verdict against the Le Guennecs will be announced by the Judge on 20 March and if found guilty for concealing stolen goods, they could be sentenced to five years in prison and fine of 375,000 euro or more. I have just received the following message and, since it seems so relevant to this blog, I thought I'd spread the word. 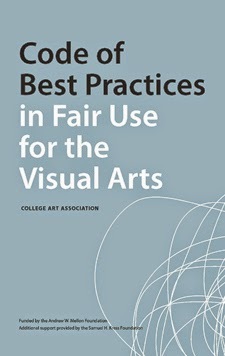 The document itself is 22 pages in length (inclusive of covers, credits etc), clearly written and with a couple of well worth while appendices on fair use today and the methodology employed in creating the Code in the first place. There's nothing on the face of it, though, that indicates that it is a Code addressed specifically to the United States. Words like "international", "Europe" and "foreign" could not be found on a word search of the Code's text. There's nothing wrong with the Code being US-based, of course, but this blogger has met, over the years, too many creative souls who assume that what is permitted -- or prohibited -- in one country is permitted or prohibited in all, and he would like Codes such as this to make it very plain for non-lawyers as to where their provisions are likely to be most helpful. Transformative use of a building: does it infringe architect's moral rights? 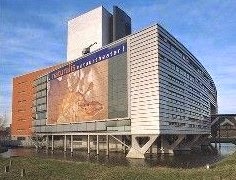 “My building is of a high architectural quality; it should not be used for storage,” Verheijen said. He insists that the existing exhibition space should be maintained and recommends the museum instead build an extension onto the current space for the office and storage requirements. “I’m not against another architect designing that,” he noted. This blogger loves the line about "we are articulating his design rather than inflicting an injustice to it" and wishes he had composed it. Having said that, copyright does not impose a binary system on the outcomes of intellectual creativity. It is open to an initiative to be both an articulation of a design and injustice to it. Since there is no accounting for taste, no attempt will be made here to predict the outcome of the forthcoming legal proceedings -- though readers will doubtless have their own opinions. Thank you, Chris Torrero, for this link. A recent story in The Guardian caught my eye. It was used by Jonathan Jones as an example of lack of the 'amateur delusion of photographic art' but the post about what level of copyright protection should be given for photographs (and whether that should vary dependent on the type of photograph) will have to wait for another day. 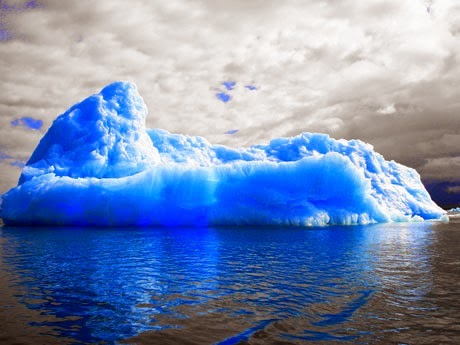 This story concerned a photograph of a glacier which was taken by a British language student back in 2006. 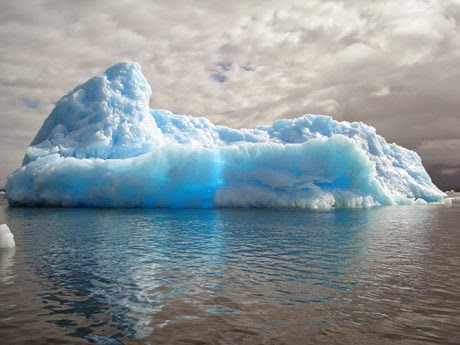 Sarah Scurr was on a boat trip around the Patagonian ice fields when she took a photograph of glacier. She was living in Chile at the time but when she returned to the UK in 2009 she decided to enter it into The Telegraph's The Big Picture photography competition. The Big Picture competition is explicitly aimed at finding good quality holiday snaps and the prize is currently a £500 Nikon camera. Last month the photograph came to the attention of another photographer, Marisol Ortiz Elfedt. She was very surprised to see that the photograph had been published in The Telegraph. It was an image she was very familiar with and looked very similar to one she had taken in 2006. She complained to The Telegraph who investigated. It turned out that the two photographs were taken on the same day and, given the fact they were on a moving boat, likely at more or less exactly the same time. Think how many identical photographs there must be of famous landmarks stored on various computers around the world. As Scurr, when interviewed by The Telegraph commented, it is surprising that issues like this do not arise more often. Clearly copies like this do not infringe copyright but the position is more complicated when people try to recreate a famous photograph having the photographic image (rather than the scene or object) clearly in mind. One UK case which springs to mind is Creation Records. A photograph of an Oasis album cover was taken by a tabloid photographer before the official photograph had been taken (and from a different angle and distance). There was no copy of an original work - the judge easily found that there was no copying of the photograph (see below) and arguments that the arrangements of props constituted a dramatic work, collage, sculpture or work of artistic craftsmanship all failed. Next, Mr Merriman contended that Mr Seeburg's photograph was itself a copy of the official photograph taken by Mr Jones, regardless of the order in which the two were taken. I do not see how that can be argued. If the subject matter is not itself copyright, in principle two different photographers can take separate photographs of the same subject without either copying the other. Of course copyright subsists in the official photograph and if it were the only source of the scene it would be an infringement to copy that, either by a direct copying process or by the scene being recreated and a fresh photograph taken of that recreation. 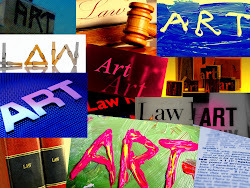 But it is a basic proposition of copyright law that two works created from a common source do not by reason of that fact involve copying one of the other, however similar they are. Consequently the claim of copyright infringement failed. However, had the tabloid photographer recreated the official photograph rather than photographing the scene, he would almost certainly have infringed. There are two morals to this story. First, be careful before crying copyright infringement - remember that it may be a coincidental image - is it identical or just very similar? Secondly, as we know from the red bus case, recreating a photograph can still infringe. This is theoretically the case even if it is of a famous building or landscape - although the less creative the composition the more the similarity of technique, lighting, effects etc will be important in determining whether a substantial part has been taken. For those worried about the outcome of the Creation Records case, whilst the copyright infringement claim may have failed, the judge found in favour of Oasis and granted an interim injunction on the basis of breach of confidence. It has been reported that the Islamic State has stepped up its ‘purge’ of Iraq’s cultural sites over the past month, most recently in Mosul – Iraq’s second city and the largest city currently controlled by the extremists. Considering ‘culture, civilization and science as their fierce enemies’, IS’s occupation of the city has seen the destruction of dozens of historic sites holding meaning for Jews, Christians, and Muslims alike, including the ancient Nineveh wall, the Citadel Church and the mosques and tombs of the prophets Seth and Jonah. Mosul Museum is now reported to be under the control of IS, with the museum’s prized collection of art and antiquities facing destruction or sale on the black market. Numerous reports point to IS using the looting and trafficking of such antiquities to fund their campaign. Most recently, Mosul’s Central Library had around 2,000 items, including maps and books dating from the Ottoman Empire, seized and allegedly burned for promoting ‘infidelity’ and ‘disobeying Allah’. Whilst during the Iraq War residents near the Central Library secreted away centuries-old manuscripts to prevent their looting or destruction, IS has declared the penalty for such actions death. Meanwhile UNESCO has called the protection of cultural heritage in Iraq and Syria ‘a security imperative’, and suggested that protected cultural zones around heritage sites could be created through a ‘bottom up plan of action’, built on locals’ increasing aversion to the violence, bloodshed and suffering. The meeting of 500 delegates at Paris headquarters in December also called for implementation of the 1954 Convention for the Protection of Cultural Property in the Event of Armed Conflict and its protocols, as well to end impunity against deliberate attacks on cultural heritage, which is a war crime under the Rome Statute of the International Criminal Court. Read more about UNESCO's call for protected cultural zones in Iraq and Syria here. 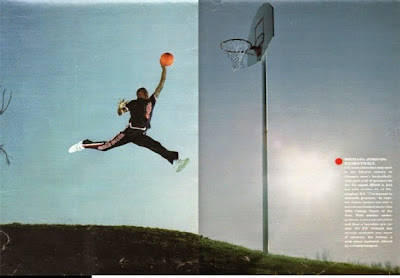 Is copyright in a 1980s Michael Jordan photo infringed by the Jumpman logo? In the run up to the 1984 Olympic Games, Jacobus Rentmeester took various photographs of Michael Jordan for LIFE magazine. The iconic image which he ultimately produced involved a jump which Rentmeester asked Jordan against a plain skyline with freshly cut grass. The photograph that he took is below. According to Rentmeester's complaint, following publication of his photograph in LIFE magazine, Nike paid Rentmeester $150 for temporary use of two 35mm colour transparencies. The invoice stated that this was “for slide presentation only, no layouts or any other duplication”. Mr Rentmeester apparently complained about Nike's use of his photograph to create the above image and in 1985 he reached a settlement with Nike whereby, in return for $15,000, he agreed that Nike could use the photograph on posters, billboards etc in North America only for two years. Rentmeester is now complaining that Nike continued to use the photograph beyond both the term and the territorial restrictions imposed by the 1985 agreement. Significantly, Rentmeester is claiming that Nike's use includes the famous Jumpman logo. For those unfamiliar with the logo, the complaint includes the following handy comparison of the silhouette of Michael Jordan in the Rentmeester photograph (left) with the Jumpman logo (right). "Mr. Rentmeester wanted to maximize visual attention on an isolated figure of Mr. Jordan, and so the photograph needed to be taken outside, with a background of sky rather than the interior of an auditorium. Mr. Jordan would be depicted in away to express his tremendous athletic ability: he would leap through the sky and appear to soar elegantly. Mr. Rentmeester created the pose, inspired by a ballet technique known as a “grand jeté,” a long horizontal jump during which a dancer performs splits in mid-air. The pose, while conceived to make it appear that Mr. Jordan was in the process of a dunk, was not reflective of Mr. Jordan’s natural jump or his dunking style. Mr. Rentmeester further planned that Mr. Jordan would leap with his left leg forward and his right leg behind, and his left hand extended while holding the basketball, so that the basketball would appear to be perched on top of his fingertips, his body open and facing the camera, his limbs extended outward, and his right hand open, showing his fingers." Given that level of input into the creative process, following Infopaq and Painer, the photograph would be protected in the EU as Rentmeester's own intellectual creation. Presumably the position is the same in the USA. 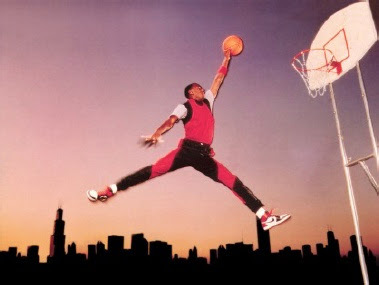 The cause of action arose in 1987 – when the licence expired (or possibly sooner if Nike used the photograph/Jumpman logo outside of North America before then). So, why has Rentmeester waited? The cause of the delay is anyone’s guess – lack of money, time or inclination to do anything about it in the late 1980s, perhaps. However, the reason why he is pursuing the claim now is thanks to Raging Bull, or more precisely, the US Supreme Court’s decision in Petrella v MGM which was decided in May 2014. The US Supreme Court found that because the US Copyright Act limits retrospective relief to three years before the date of claim, laches does not apply. Laches is the equitable doctrine that states you cannot pursue a claim if you have unreasonably delayed in bringing a claim - 30 years would likely have constituted an 'unreasonable delay'. Moreover, the court decided that ‘when a defendant commits successive violations, the statute of limitations runs separately from each violation.’ In other words, every time that Raging Bull is distributed (or Nike sells a pair of Jumpman branded goods) a new three year limitation period starts to run. It is worth noting that it follows from this that there is no benefit to Mr Rentmeester in waiting until now. If he had pursued Nike sooner, he could have recovered losses based on past infringment and obtained a licence covering future use. As it is, the best Mr Rentmeester can expect is damages for the three years prior to issuing his claim and a licence for use going forward. Does Rentmeester have a claim? At first glance, it is easy to see why many people online are dismissing this as another example of IP law gone crazy. “It’s Michael Jordan who posed not the photographer” is typical of the general sentiment behind these posts. However, I’m not sure it is quite so simple. The pose in the photograph is not a natural one, it was deliberately selected by Mr Rentmeester (together with the plain background which makes the pose stand out even more). Further, although I am no expert(!) it does not appear that Michael Jordan ever employed this balletic pose when actually playing basketball. Further, Nike obviously thought that it required a licence when it settled with Mr Rentmeester in 1985. Should Rentmeester's rights in the photograph extend to the logo? The copy of the Rentmeester photograph does appear to have been used since 1987 but it is the translation of the Nike photograph into the Jumpman logo which is where the money (and hence the battleground) lies. 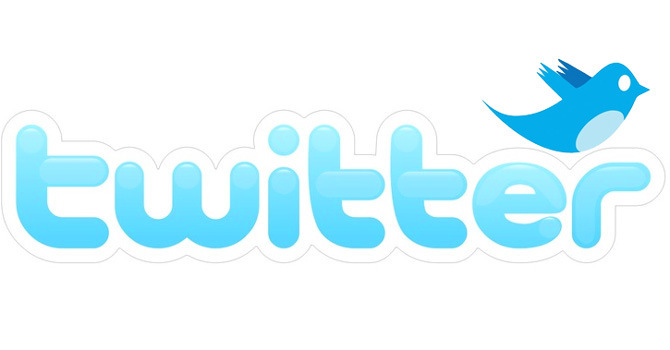 Is this translation into a logo a ‘transformative use’? Prior to Cariou and Prince, the answer would have been a definite "no". But now the situation is less clear. Indeed there is an argument that if Cariou lost to Prince, surely it follows that Rentmeester must lose to Nike. Whilst researching this post, I found out that Michael Jordan is no stranger to IP litigation. He has had a long running dispute with a Chinese sportswear company, Qiaodan (the transliteration of “Jordan” in Chinese). Jordan claimed that Qiaodan mislead customers into believing that he has authorised the use of his name (and his children’s names – which Qiaodan has applied to register as Chinese trade marks). Meanwhile Qiaodan sued Michael Jordan for $8million in retaliation claiming that his allegations had prevented the company from pursuing an IPO. Interestingly, Qiaodan chose to use a logo which was more akin to Jordan’s traditional basketball movements (see below). You can read Rentmeester’s complaint here. Note: I could not find Nike’s response online - if anyone has a copy (or knows when it will be filed) please let me know.